He is also adjunct professor of Graduate School of International Studies at Hanyang University. He is honorary professor of Economic Research Institute of the Far Eastern Branch of Russian Academy of Sciences and honorary professor of the Far East Institute of International Relations in Russia as well. 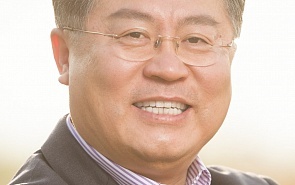 Lee Jae-Young has over 20 years of professional experience as an economist and academic. He served as an academic visitor at Wolfson College of University of Oxford, a visiting scholar at Davis Center at Harvard University. Lee Jae-Young has conducted numerous research in Korea's economic strategy toward Russia and Eurasia including the CIS countries. Recent publications: The Political Economy of the Pacific Russia (coauthor, 2017), Evaluation of Korea-Russia Economic Cooperation and its mid-to long-term Vision (coauthor, 2015), etc. The denuclearization process of the Korean Peninsula depends on Russia playing a constructive role. The establishment of a peace regime on the Korean Peninsula can contribute not only to substantial advances in Korea-Russia relations but also to full-scale multilateral economic cooperation projects between the two Koreas and Russia, and toward peace and common prosperity in Northeast Asia and Eurasia. ﻿Lee Jae-Young, President of the Korea Institute for International Economic Policy (KIEP), spoke about the prospects of trade relations between Russia, South Korea and the Eurasian Economic Union (EAEU), as well as the importance of diversification policy in the face of increasing protectionism, in an interview with www.valdaiclub.com on the sidelines of the Eastern Economic Forum-2018 in Vladivostok. Two major issues are of importance to President Moon regarding North Korea. First, easing the confrontation between North and South Korea as swiftly as possible and preventing the possibility of war for certain. Second, establishing a foundation for a unified Korea by opening an era of common prosperity and peace on the peninsula. Therefore, the new administration will use diverse political measures to solve the North Korean nuclear threat. Supporters of populism in major economies are those who are hit the hardest by globalization and low growth, i.e., those with low levels of income, education and job security. With growing demand from such voters in major economies, we might see a further rise of trade protectionism in major economies, which will paint the prospects of global economy even darker. There is, at present, little basis for projections on how significantly a Trump presidency will alter Washington’s relations with APEC countries, in the security or economic spheres.